Allow kettle to warm for approximately 5 minutes. While corn is popping, keep front operator doors slightly ajar to prevent fogging. Keep hopper door at “out” position to aid in catching stray popcorn. Allow corn to pop until popping ceases, usually when 3-4 seconds lapse between pops. Then pour remaining popped corn from kettle by rotating handle clockwise 1/3 turn and pulling downward. Repeat steps 1-5 for additional batches. Turn KETTLE switch to OFF position when finished preparing popcorn; POWER or LIGHT switch may remain ON to display and heat popcorn. Pan ontvetten, *niet* onderdompelen in water, verwarmings-element kan daar niet tegen. Mocht toch water tussen de binnen en buiten pan komen, graag melden, moet *lang* daarna drogen. 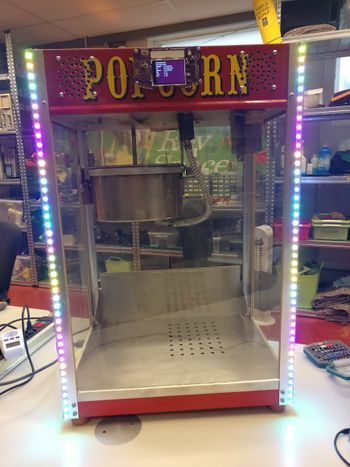 Bodem plaat er uit, alle popcorn er uit halen en hele binnenkant ontvetten. Alles weer in elkaar zetten. A second hand Paragon Theater Pop 8 machine. It even comes with a full technical manual. YX5300 UART MP3 player, clone of a Catalex serial MP3 player. Meanwell 100W 5V power supply Slight overkill, we need about 60W for the NeoPixels full on and full volume music, but it is good to get extra power, as the power output drops as things get hot above the kettle. Random thermally stable wires, protoboard and some extra caps for buffering the 5V and filtering noise. Omniulux 40W UV/Blacklight lamp to replace the boring display lamp. Ja, dat kan! Overleg even aub met User:Gori eerst. Hieronder lijstje van dingen die hoe dan ook ooit moeten/kunnen. Bij een van de led strips is een kabeltje los, weer vastzetten. De neopixel strips glitchen, vermoedelijk door signaal fouten in de overgang naar parallelle bedrading. Ooit goed maken. This page was last modified on 4 February 2018, at 18:02.